More than 200 hikers are trapped on a mountain on the Indonesian tourist island of Lombok, after a deadly earthquake triggered landslides which cut off escape routes. Hundreds of rescue workers are now working to evacuate them from Mount Rinjani, a popular hiking destination. The 6.4 magnitude earthquake struck early on Sunday not far from the base of the mountain. At least 14 people have died, and more than 160 were injured in the quake. 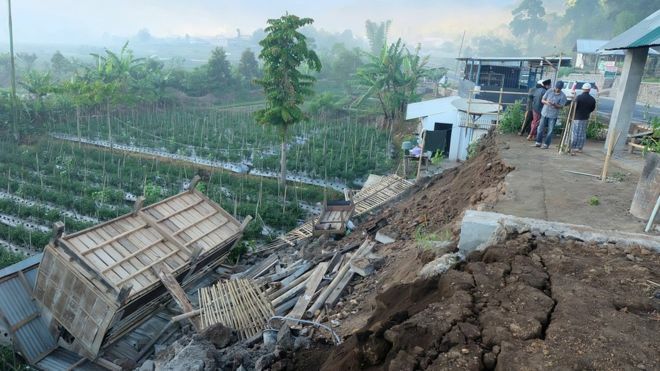 Thousands of homes have been damaged and hundreds have been left homeless as substantial aftershocks rocked Lombok and neighbouring Bali island. A Malaysian tourist who was on a hiking trip to Mount Rinjani was among those killed. Another young Indonesian hiker was also killed by falling rocks. Hikers from France, Thailand, the Netherlands and Malaysia are among those waiting to be evacuated off Mount Rinjani. Authorities say more than 500 people, mostly foreign tourists, have already come down from the mountain but 266 are still trapped up there. Helicopters are now searching for the stranded. Dramatic footage filmed by guides on the mountain at the time of the earthquake showed huge landslides near the crater lake. One tour guide, named as Sukanta, described the situation of those trapped up on the mountain. “Some of the people [were at] the lake, because the location of the lake is in the middle…they cannot go anywhere because of landslides… They have to stay near the lake,” he said. A group of Malaysian tourists, who have now reached safety and are due to leave Lombok by plane on Monday had earlier posted for help on Facebook.